No San Francisco 49ers fan needs to be reminded about the team's dismal 1-10 record, but some are making sure to remind owner Jed York that general manager Trent Baalke needs to be canned. 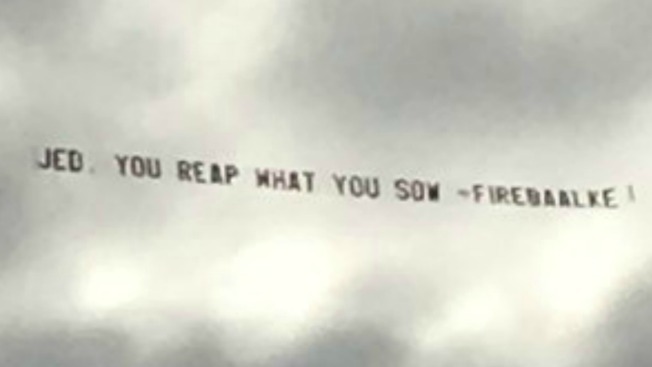 An airplane circling Levi's Stadium Sunday morning depicted a banner reading: "Jed, You Reap What You Sow - Fire Baalke!" That message of criticism pokes directly at York's choice to stick with Baalke, a leader who has been heavily criticized for allowing a once-upon-a-time smash-mouth force crumble into a heap of unproven talent that has given fans little to cheer for. Ever since parting ways with former head coach Jim Harbaugh, the man who led the squad to the Super Bowl in 2013, Baalke has been decribed by critics for his management mishaps that have resulted in San Francisco tallying just six wins to go along with 21 losses since the start of last season. Sunday's message isn't the first to fly over the Santa Clara stadium and castigate the franchise. In 2015, a banner read "Jed & 49ers Should Mutually Part Ways." Earlier this year, fans attempted to fly a banner calling for Baalke's firing, but that effort was grounded when the scheduled pilot "was not available to fly." However, when planes weren't circling overhead, fans took it upon themselves to flash "Fire Baalke" T-shirts.